Wow, I am really slacking on the blog posts. I’m going to blame it on being 38 weeks pregnant…. I better use the excuse while I still can! 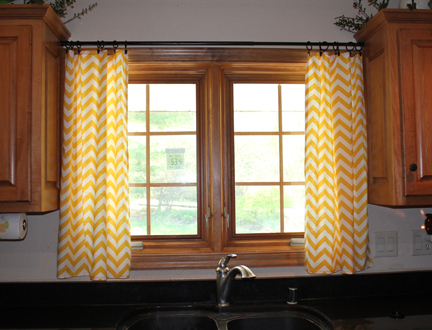 So I’m finally getting around to posting pictures of the yellow chevron kitchen curtains I made. They’ve only been done for about a month and a half now!! Here’s the story behind my beloved chevron fabric. The hardest part of the whole thing was cutting the fabric so the pattern was aligned and not crooked. The sewing was quick and using the curtain rings with the clips made the final steps super easy. Now I just have to make a matching or coordinating valance for the window behind the kitchen table. I don’t think that will get done before baby #3 is born, but I’ll get there eventually. I hope everyone is enjoying summer! This entry was posted in DIY, Sewing Projects and tagged chevron, chevron curtain, diy curtains, diy kitchen curtains, yellow chevron. Bookmark the permalink. They look awesome! You not only have the new baby excuse, but you have 2 other kiddos too!